Crusaders in Frankish Greece, Athens, William I, AD 1280-1287 and Guy II, AD 1287 to 1294. William I, AD 1280-1287 and Guy II, AD 1287 to 1294. Reference : COINS OF THE CRUSADER STATES - Pages 368, #86. Size : 16.7 x 18.2 mm. Weight : 0.62 grams. Obverse : Short cross with G DVX ATENES around, with double pellet tops. Reverse : Castle tournois with bar and open circles, with ThEBE CIVIS around, with double pellet stops. 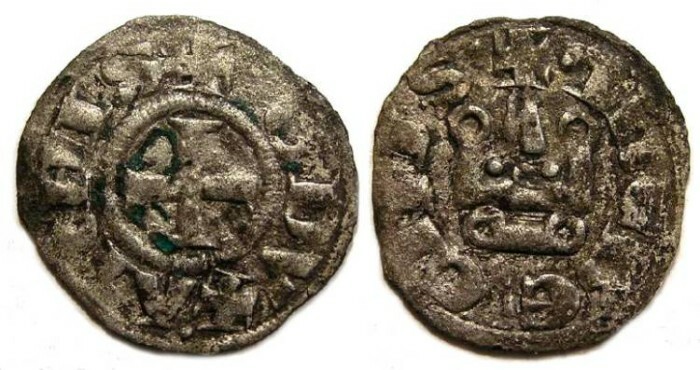 It is likely this type was issued during both the rule of William I, AD 1280-1287 and during the minority of Guy II, AD 1287 to 1294. Because the medieval form of William is spelled as with a G for the W, both William and Guy would have used this inscription starting with a G.